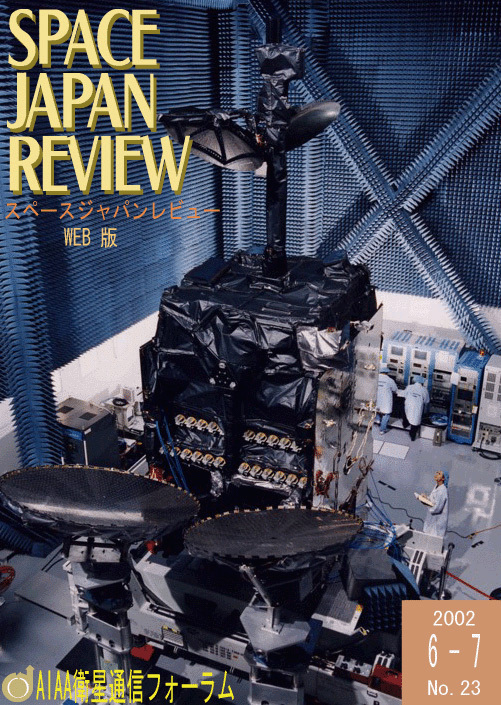 "The DIRECTV-4S satellite under final tests in the BSS factory"
Seiko Arizumi, who works at the B-SAT Kawaguchi Broadcasting Satellite Control Center, talked to us about her first experience with satellites, and about current satellite control operations. The JCSAT-2A satellite, the successor to the JCSAT-2 satellite operating in a 154-degree-east orbital slot, was successfully launched from the Guiana Space Center in French Guiana on March 29, 2002, and started operations on May 10. NASDA launched a new integrated space project called 'i-Space Project', which consists of three satellite projects: Engineering Test Satellite VIII (ETS-VIII), Wideband InterNetworking engineering test and Demonstration Satellite (WINDS), and quasi-Zenith satellite (Figure-Eight satellite) projects. "AIAA Technical Committee on Communications Systems"
AIAA Technical Committee on Communications Systems (TCCS) was held on 12 May 2002 at Hilton Montreal Bonaventure in Montreal, Canada. "23rd International Symposium on Space Technology and Science (ISTS)"
The 23rd International Symposium on Space Technology and Science (ISTS) was held at Shimane Prefecture Assembly Hall and Kunibiki Messe in Matsue City, Shimane Prefecture in Japan from May 26 to June 2, 2002. "AIAA 20th ICSSC (International Communications Satellite Systems Conference)"
The 20th AIAA ICSSC was held in the Hilton Montreal Bonaventure hotel at Montreal, Canada from May 12 to 15, 2002. Total number of registered participant is 320. Although I tried to collect all manuscript by the end of May, it has been completed along with World Cup. However, I have self-confident with the contents of this month, such as CEO Interview of Boeing Satellite Systems President Mr. Brinkley and etc. The 20th ICSSC (International Communications Satellite Systems Conference) ended successfully with over 500 participation at Montreal, Canada from May 12 to 15. 21st ICSSC will be held in Yokohama in April 2003. JFSC is fully backing this convention and we would like to ask all readers support, also.